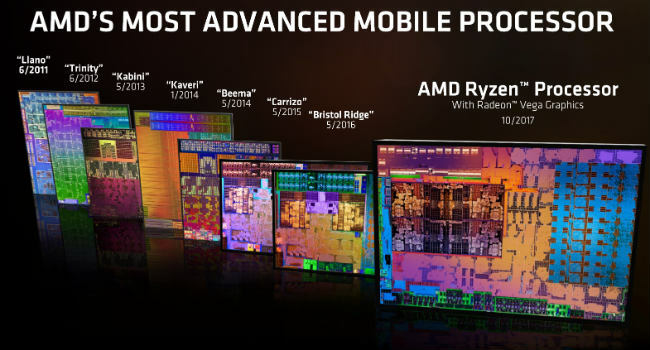 The highly anticipated AMD Ryzen mobile processors are here and with this AMD has finally completed its entire launch lineup for the year. The company is continuing its legacy of launching APUs for laptops and (as expected) the two new SKUs are also APUs. 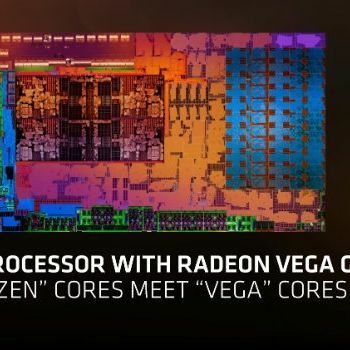 Hence, they combine AMD’s Ryzen CPU architecture with its VEGA GPU cores on a single die and then it packs everything in an impressive 15W power envelope. 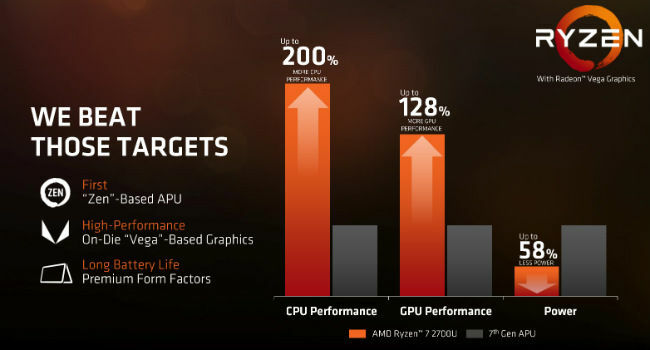 In fact, AMD claims 200% and 128% increase in CPU and GPU performance respectively. Many laptop makers, such as Acer and HP have already committed their support to the new processor lineup and if everything goes as planned, we might see a few Ryzen-powered laptops before the end of this year. Before we get into performance graphs and the technologies employed by AMD, here is a look at the specifications of the two new SKUs. 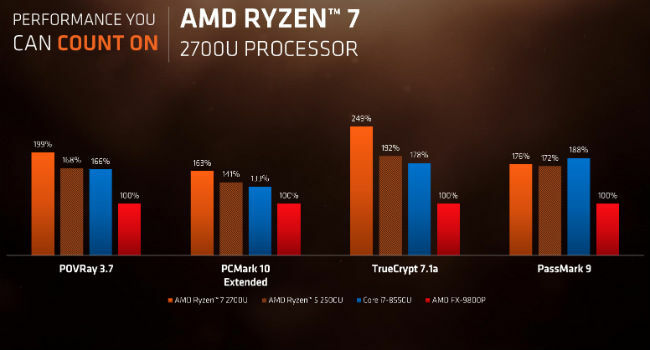 As you can see, the Ryzen 7 2700U and the Ryzen 5 2500U APUs go head-to-head with the newly launched Kaby Lake refresh announced by Intel in terms of core counts. AMD has also improved its manufacturing process and compared to last year’s 28nm FX-9800P, the new Ryzen APUs utilises a 14nm process. This means that you should get improved performance as well as better battery life. 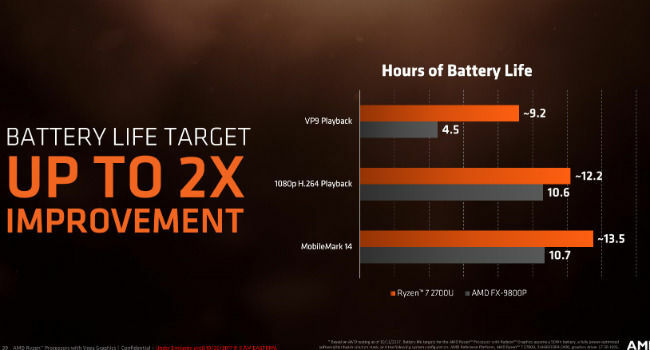 Like always, AMD is claiming big performance numbers with its new Ryzen mobile APUs. The company is claiming that there is a 200% increase in CPU performance, 128% increase in GPU performance and an impressive 58% improvement in battery life as compared to its last gen APUs AKA Bristol Ridge. That said, AMD’s Bristol Ridge processors weren't that great to start with. What is more striking though, is that the new APUs look equally impressive stacked against its Intel counterpart. As one can see in the image below, AMD is keeping last year’s FX-9800 as base and compared internal test results of performance to Intel’s Core i7-8550U. The 8550U is a 4 core, 8 thread processor, which sits right below the top of the line Intel Core i7-8650U. Adding to that is the gaming performance of the new APU. This year, AMD has shifted from its old GCN GPU architecture to the new Vega architecture. 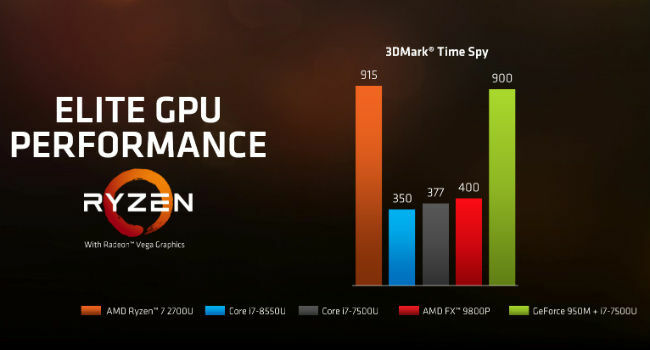 AMD claims that the Ryzen 7 2700 scores 915 points in 3D’s Mark time Spy benchmark. In comparison, the Intel Core i7-8550U with an integrated Intel UHD 620 manages to score 350 points. At the same time, the Ryzen APU also managed to beat the NVIDIA GeForce 940MX paired with an Intel Core i7-7500U. All things said, the numbers do look promising. However, it should be noted that the performance and battery efficiency will differ based on the system in different test environments. 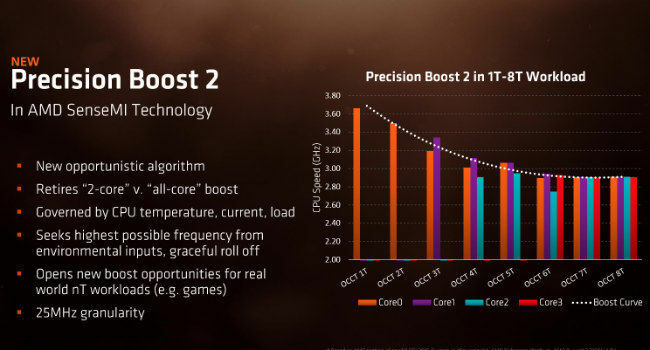 While there are many factors that may be at play here, the biggest change we believe is the new Precision Boost 2.0 technology that AMD is bringing with the new APUs. For years, most x86 CPUs from AMD and Intel deployed boost, which is based on how many cores and threads are under load. With the Ryzen APU, the company has switched to a more intelligent setup. So, rather than applying boost based on load, the Ryzen APU applies its boost algorithm taking into account CPU temperatures, available power (which depends on wall socket, battery specification and remaining battery power) and how much load is applied. Once this is calculated, the APU will engage boost regardless of whether one thread is being used or all. AMD has also given more granularity to this process as the Ryzen mobile can do frequency bumps as low as 25MHz at a time, instead of 100MHz at a time. Laptops makers also have the option of mXFR on these APUs, but since laptops have limited space (thermally, power-wise and battery-wise), it will be something that can be enabled on a case-to-case basis. 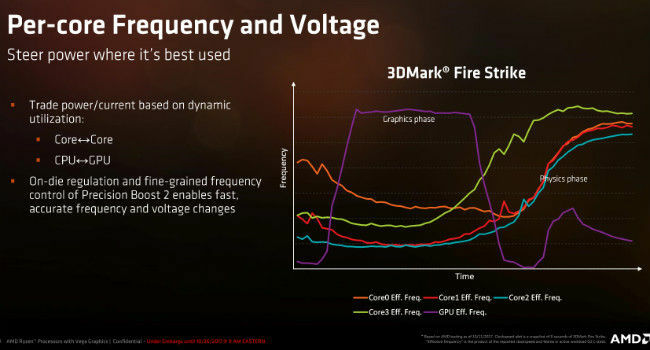 XFR, if you are not aware, is AMD’s eXtended frequency range technology, which the company introduced earlier this year on its desktop class CPUs. This is an automated overclocking feature that will boost clock frequencies above the advertised boost frequency based on the capabilities of the CPU cooler. This may result in newer designs from gaming laptop manufacturers to exploit the Ryzen chip to its max potential. However, cooling is a critical aspect that needs to be taken care of to bring out the best of Ryzen APUs. Performance is one thing, but when it comes to mobile processors, managing the power going into that processor is as important. 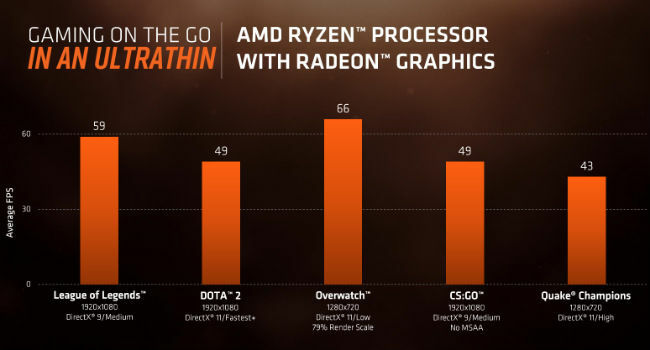 Instead of providing one power rail to the compute core and one power rail to the graphics and putting the controller on the motherboard, AMD has done things very differently. AMD has divided all cores into separate voltage zones, which allows Ryzen APUs to fire up individual cores if-and-when required. This design is made further cost efficient for the motherboard makers as all this is done on the SoC itself. In addition, since the TDP overhead is limited, the compute core and GPU can trade power dynamically based on utilisation. AMD has done more optimisations on the sleep state of each core, focusing on how to save power when the system is idling. Like smartphone processors, the more powerful cores go to a light sleep state until required. AMD says that most of this achievable through their infinity fabric, which consists both the data as well as the system controls. The gist of this is that by applying multiple new techniques, AMD is claiming more than 50% battery efficiency over its previous gen APU. AMD says that the new Ryzen APUs are designed for ultra-thin notebooks. It states that the new packaging is 24% thinner than its last gen chip. That is not a huge drop in size, but in the ultra-thin laptop universe, every millimeter counts. AMD also announced that starting in Q4 this year, laptops makers such as HP, Lenovo and Acer will be bringing devices powered by the new Ryzen APUs. However, a wider range of Ryzen-powered laptops should hit the market in Q1 2018. I want to know about Karbonn Titanium S19 .